RaptorGL is a 3D engine especially built for the tutorial section of the oZone3D.Net site (that's true, we don't let ourselves go short!). This engine is aimed to give a good idea of how things work deep insideHyperion. This engine is somehow an answer to feedbacks regarding some tutorials received from the community which were concerned about how things are implemented "in the wings" of Hyperion. 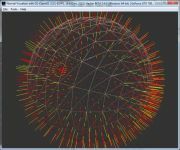 RaptorGL is a 3D experimental engine in the sense that it provides a testing platform within the reach of everyone in order to build up and to experiment new real time 3D algorithms. The release of RaptorGL will be done depending on the requirements of the new upcoming tutorials. For the moment, a few functionalities are available but the engine offers anyhow a quite complete interface in order to deal with the GLSL shaders (two codepaths are available for GLSL: the ARB codepath and the GL2 codepath). The main interest of RaptorGL lies in the total availability of the sources codes. Nothing is better than a full immersion in the code for a good understanding of an engine. RaptorGL may also be a starting point for building your own 3D engine. Actually, the fundamental briks are working and adpating these functionnalities to your own specific needs can be done quite easily. Mesh - (built-in shapes: torus, box and plane) - 3D model loading not yet available. The goal is not to turn the engine into a complete 3D engine, which would require several months or years. The missing functionalities will be added little by little according to the tutorials. The actual functionnalities are sufficient for the first tutorials such as this one: Mesh Deformer. RaptorGL is provided as a static library designed to be linked with your project. I will not go through details regrading the compiler configuration, there are many forums for that all over the net. The example projects are intended for Visual C++ 6.0. The conversion into VC2005 should not pose any problem (except the billion of warnings that are generated by the new security standards in the Microsoft spirit...). All the visible objects of the scene have the same default material. 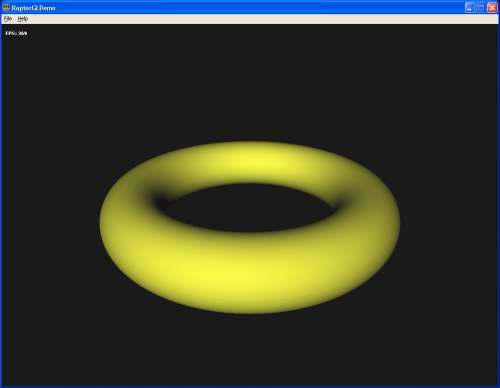 It is then necessary to suppress it and to attach a new material (torus_mat_yellow) to the torus . RaptorGL may be downloaded from the following page: [:: RaptorGL SDK ::]. Page generated in 0.0031697750091553 seconds.